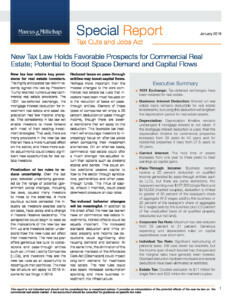 New tax law retains key provisions for real estate investors. The highly anticipated tax reform recently signed into law by President Trump retained numerous key commercial real estate provisions. The 1031 tax-deferred exchange, the mortgage interest deduction for in-vestment real estate and asset depreciation had few material changes. This consistency in tax law will enable investors to move forward with most of their existing investment strategies. That said, there are many provisions in the new tax law that will have a more nuanced effect on the sector, and these more subtle adjustments could create significant new opportunities for real estate investors. Finalization of tax rules to reduce uncertainty. Over the last year, elevated uncertainty generated by the range of potential government policy changes, including tax laws, caused many investors to move to the sidelines. A more cautious outlook pervaded the industry as investors awaited clarity on taxes, fiscal policy and a change in Federal Reserve leadership. This perspective could begin to ease as the implications of the new tax law firm up and investors better under-stand how the new rules will affect their investments. The new tax plan offers generous tax cuts to corporations and pass-through entities such as Limited Liability Companies (LLCs), and investors may see the new tax rules as an opportunity to reconfigure their portfolios. The new tax structure will apply to 2018 in-come for tax filings in 2019. Reduced taxes on pass-through entities may boost capital flows. Perhaps more important than the modest changes to the core commercial real estate tax rules that investors have been most focused on is the reduction of taxes on pass-through entities. Owners of these types of companies will enjoy a 20 percent deduction on pass-through income, though there are several restrictions that will apply to this deduction. This favorable tax treatment will encourage investors to increasingly focus on after-tax yields when comparing their investment alternatives. On an after-tax basis, commercial real estate could offer a much stronger risk-adjusted re-turn than options such as dividend stocks and bonds. This could entice additional passive capital to flow to the sector through syndicators, partnerships and other pass-through funds. This influx of capital, should it manifest, could place downward pressure on cap rates. Tax-induced behavior changes will be meaningful. In addition to the direct effect the new tax law will have on commercial real estate in-vestments, indirect effects could be equally important. The increased standard deduction and limits on local property and income tax deductions could significantly alter housing demand and behavior. At the same time, the elimination of the personal mandate of the Affordable Care Act (Obamacare) could impact long-term demand for healthcare real estate. The new rules could also spark increased consumption spending and more business in-vestment into infrastructure.